The NASA-sponsored Classroom of the Future serves as the space agency's principal research and development center for educational technologies. The Classroom of the Future™ opened on the campus of Wheeling Jesuit University in 1990 with one employee whose job involved delivering NASA educational materials and programs to local classrooms. Today the Classroom of the Future provides NASA with the educational research and expertise necessary for creating and delivering state-of-the-art education to the NASA audience, be they young or old. NASA relies on the Classroom of the Future in a variety of roles. We coordinate the education programming on NASA Television. We have created an iPad app so students can see how plants could be grown to support astronauts at a lunar base. We benchmark the field of educational technology to show what works and what doesn't. The role of the Classroom of the Future is ever changing to meet the needs of NASA as it seeks to pioneer the future in space exploration, scientific discovery, and aeronautics research. 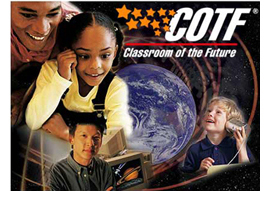 Classroom of the Future™ was developed under a cooperative agreement with NASA.